Today’s special guest is Mitzi Childress. The gracious mother of 2 has been doing real estate on and off since she was younger but has now decided to do wholesaling full-time. She now earns an average of $20, 000 to $25, 000 per month and she’s now meticulously building her team so she can get more leads and close more deals. What’s the secret of her wholesaling success? While a lot of factors are involved, several of the deals she’s closed have been attributed to her ability to establish rapport and effectively build a relationship with the prospective sellers. In this episode you’ll discover how to do both so you better be all ears! While she has been a financial adviser for 10 years, helping people with their health has been Mitzi’s focus prior to wholesaling. The one time wellness counselor and meditation teacher however soon realized she can also help people through a career in wholesaling. She sent out mails to the divorce list and she received a call from a seller who is going through a painful divorce. Wanting to help rather than just close the deal, she recommended that the seller deal with realtors. However, seller opted otherwise and instead asked her for her highest offer. She offered the seller $140, 000 and was able to sell the property for $165, 000. That’s a whopping $25, 000 profit for a deal she closed in just 7 days! While the seller has the option to work with others, she opted to work with Mitzi all because she was able to establish rapport and build a connection with her. 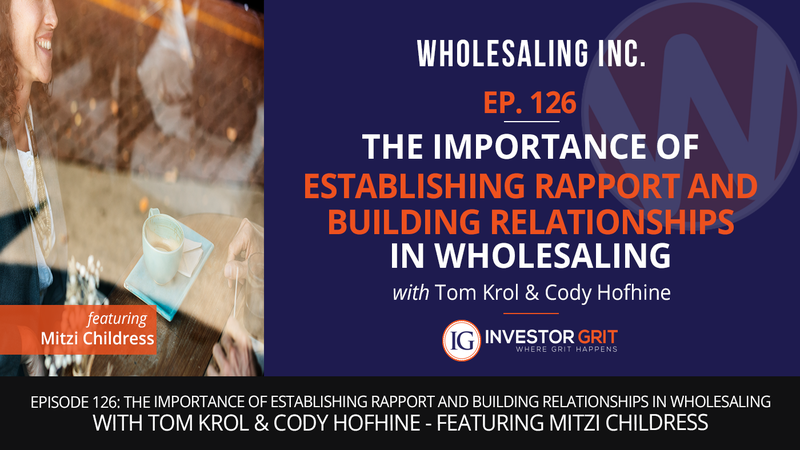 Not many may realize it but the importance of establishing rapport and building relationships in wholesaling cannot be overstated. Once you are able to successfully do both, the money will almost always follow.